1. Always make time for your Ragdoll. 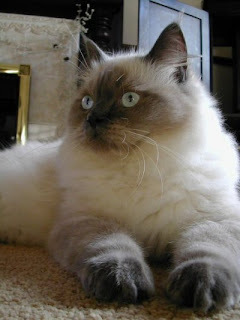 Ragdoll Cats are notoriously sociable creatures and require a lot more attention than other breeds. It is important to make you spend time with your Ragdoll preferably every day. Without your interaction, they could quickly develop behavioural problems. You can give your cat the attention it needs by simply playing with them or grooming them. 2. Groom your Ragdoll at least once a week Although Ragdoll Cat's require less grooming than other long-haired cats, it is important to groom them at least once a week. Not only will your cat have a beautifully groomed coat but it will also prevent the chances of your Ragdoll getting hairballs. 3. Don't let your Ragdoll outdoors alone. Ragdoll Cats should be either be kept indoors or be closely monitored if they are outdoors. Their gentle demeanour means that they will not defend themselves if attacked and they are at risk of contracting parasites. 4. Prevent scratching by covering the affected area with tin foil Many Ragdoll Cat breeders and owners have problems with their cats clawing furniture and other objects around the home. An easy way to stop this is by wrapping tin foil around the object. Cats do not like the texture of the foil and cease scratching it. 5. Make sure your Ragdoll has plenty of toys to play with One of the most rewarding aspects of owning a Ragdoll Cat is watching it play (and even joining in!). Playing is an important part of maintaining a healthy lifestyle for your Ragdoll. Not only does it provide fantastic exercise but allows cat and owner to bond, so it is important that your Ragdoll has plenty of toys to play with. Toys can either be bought from a pet store or found around the house. Something as mundane as a cardboard box or a large bottle top can provide hours of entertainment. I hope these tips have been of use to you and I wish you many happy and enjoyable years with your Ragdoll Cat. If you want to know more about Ragdoll Cats, I can highly recommend The Complete Ragdoll Cat Keepers Handbook by Drew Pilton. In it you will discover a plethora of "trade secrets" for looking after this amazing breed including training your Ragdoll, feeding your Ragdoll, understanding it's body language and professional grooming techniques. Written by Ragdoll experts, this book is essential reading for all serious Ragdoll cat and kitten breeders. Thanks for the Memorial Day wishes, but we are Canadian and have our own Remembrance Day in November. We wish you a peaceful, thoughtful and reverent Memorial Day, though. Come back and see the 3-Ds anytime.